Bulgin’s Overmould Flex Connector PX0897 Series is a pre-wired RJ45 patch cord to shielded RJ45 2m cable that is designed and manufactured to offer an environmentally-sealed waterproof connection. The products are manufactured to be ISO 9001 accredited, carrying international approvals. The connector is manufactured with a PUR/PVC jacket on the cable, offering a shielded system and coupler. 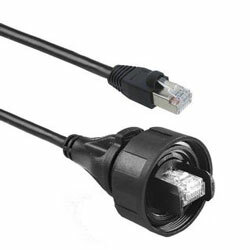 The connector flex is wireable flex. The connector is ideal for PCB panel mounting and offers IDC termination panel connector. Also available is an earth lead version of panel adaptor. There is a choice of PX0835 Sealing Cap available separately to maintain IP rating of unmated connectors. The product can mate with all PX08 Standard Series RJ45 Panel Mount Connectors. The company’s expertise improves the performance and energy efficiency of electronic and electrical equipment in automotive, consumer electronics, automation, computer/peripherals, industrial, marine, telecom, oil/gas and lighting applications.